fetch is an open source for fetch() function which is a Promise-based mechanism for programmatically making web requests in the browser. This project is a polyfill that implements a subset of the standard Fetch specification, enough to make fetch a viable replacement for most uses of XMLHttpRequest in traditional web applications. 19,780 stars by now. mermaid is a generation of diagrams and flowcharts from the text in a similar manner as markdown. 19,302 stars by now. React boilerplate is a highly scalable, offline-first foundation with the best developer experience and a focus on performance and best practices. You can create components, containers, routes, selectors and sagas right from the CLI. 19,260 stars by now. Tabler is free and open-source HTML Dashboard UI Kit built on Bootstrap 4. 15,313 stars by now. electron-react-boilerplate is a boilerplate for scalable cross-platform desktop apps, for rapid application development. 9,777 stars by now. Browsh is a fully-modern text-based browser. It renders anything that a modern browser can; HTML5, CSS3, JS, video and even WebGL. Its main purpose is to be run on a remote server and accessed via SSH/Mosh or the in-browser HTML service in order to significantly reduce bandwidth and thus both increase browsing speeds and decrease bandwidth costs. 8,976 stars by now. Formik is a small React library that helps you with getting values in and out of form state, validation and error messages, and handling form submission. Formik is 100% compatible with React Native and React Native Web. 8,430 stars by now. React-PDF is a React renderer for creating PDF files on the browser, mobile and server. 4,868 stars by now. vx is a collection of reusable low-level visualization components. It combines the power of d3 to generate your visualization with the benefits of react for updating the DOM. 4,777 stars by now. vuestic-admin is a responsive admin dashboard template built with Vue.js and Bootstrap 4. 4,489 stars by now. React From Zero is a simple (99% ES2015 less) tutorial for React – everything runs in the browser without a manual pre-compilation. It has Chinese, Brazilian Portuguese, Russian, Spanish and Korean translations for your convenience. 4,303 stars by now. Guess.js is a set of libraries and tools for enabling data-driven user-experiences on the web. 2,958 stars by now. p.s. Recently we have already written about Guess.js on our blog. This repository should have more of your attention! Itty.bitty is a tool to create links that contain small sites. 2,769 stars by now. Evergreen is a pragmatic UI kit for building evolving products on the web. It promotes building systems that anticipate new and changing design requirements. 2,445 stars by now. react-day-picker is a flexible date picker component for React. It is customizable, localizable, with ARIA support, no external dependencies, 9KB gzipped. 2,369 stars by now. Guppy is a free-to-use desktop application, a task runner for React.js designed to make it easier to get started building web products. It provides a friendly GUI for many of the typical tasks facing React developers. For example, creating new projects, running a development server, executing tasks and managing dependencies. 2,078 stars by now. Rogue.js is a server-rendering framework for React applications. It doesn’t require a special /pages directory (like Next.js) or a separate routes.js file (like After.js); all you need, is the App.js entry point you’d usually have. 1,829 stars by now. serviceworker-cookbook is an open source for a collection of working, practical examples of using service workers in modern websites, created by Mozilla. 1,494 stars by now. Rete.js is a modular framework for visual programming. It allows you to create node-based editor directly in the browser. You can define nodes and workers that allow users to create instructions for processing data in your editor without a single line of code. 1,434 stars by now. Phenomenon is a very small, low-level WebGL library that provides the essentials to deliver a high-performance experience. Its core functionality is built around the idea of moving millions of particles around using the power of the GPU. 1,060 stars by now. ReaKit is a toolkit for building composable, accessible and reliable UIs with React. 841 stars by now. React Values is a set of tiny, composable React components for handling state with render props. It gives you a set of simple, composable helpers that let you build more complex, stateful UI components like toggles, dropdowns, lists, checkbox groups, popovers, and tooltips. 752 stars by now. Vue-good-table is easy to use, clean and powerful data table for VueJS with essential features like sorting, column filtering, pagination and much more. 640 stars by now. excel4node is a full-featured xlsx file generation library allowing for the creation of advanced Excel files. 628 stars by now. Servicebot is an open-source subscription management system that automates what happens when customers subscribe, cancel, and upgrade. You can define requestable service templates with an advanced service designer that supports many input types, pricing models, and even develop plugins which can run code when these services are requested. 436 stars by now. 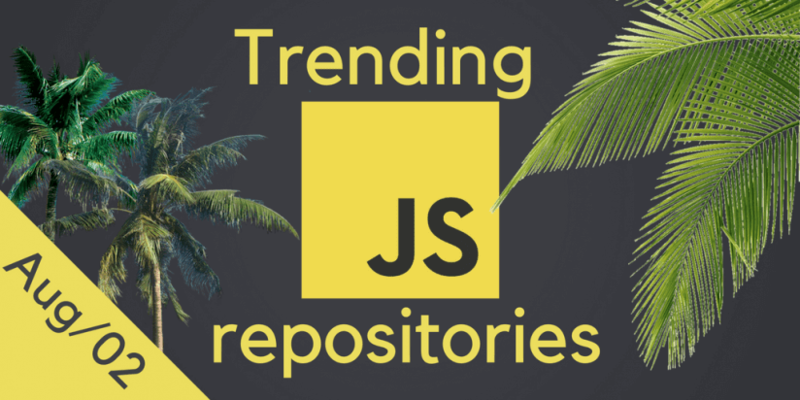 Check our previous JS digests here. If you want to receive more of interesting information, subscribe to our weekly newsletter!